This recipe is from Meera Sodha’s book Fresh India. You’ll need a food processor to grind the walnuts. Heat the oven to 200C (180C fan)/390F/gas 6 and line a large baking tray with lightly oiled foil. In a food processor, blitz the walnuts to a fine crumb. Cut the aubergines into 5cm x 2cm batons, toss in a bowl with a little oil to coat, season lightly, then transfer to the prepared tray and roast for 25 minutes, until meltingly soft. While the aubergines are roasting, make the fesenjan sauce. Put three tablespoons of oil into a large frying pan over a medium heat and, once hot, add the onions and fry for 12 minutes, stirring regularly to ensure they don’t catch. Add the garlic, fry for three minutes, then stir in the brown rice syrup, chilli powder, cinnamon, half a teaspoon of salt, a teaspoon of ground black pepper, the blitzed walnuts and the pomegranate molasses. Pour in the stock and cook for about eight minutes, until the sauce comes together. When the aubergines are tender, pour the sauce into a serving dish. 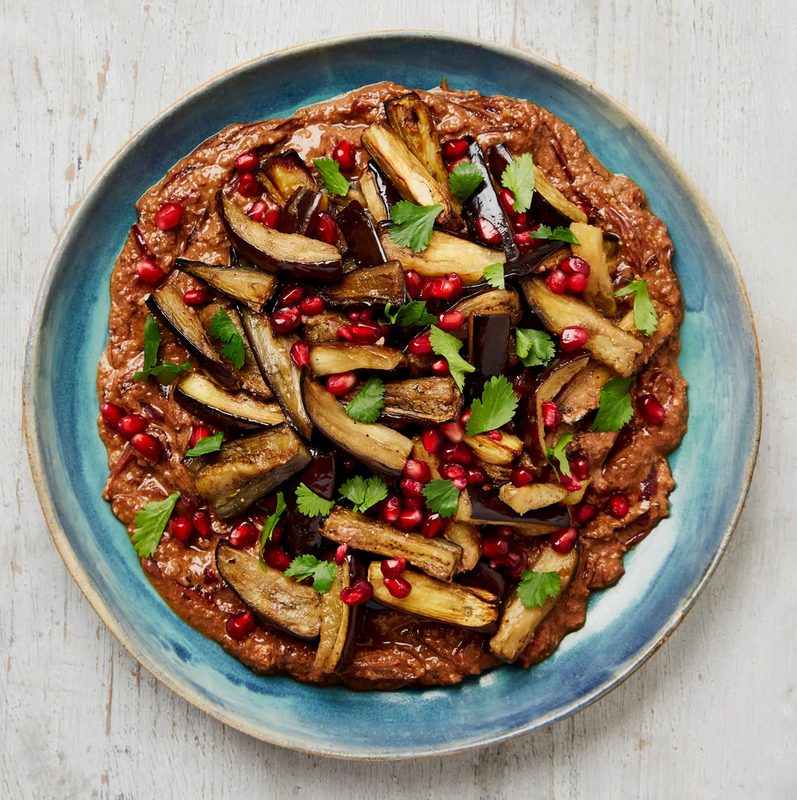 Arrange the aubergines on top, scatter over the pomegranate seeds and coriander, and serve with steamed basmati rice. Photograph: Louise Hagger/The Guardian. Food styling: Katy Gilhooly. Prop styling: Jennifer Kay. Just look at all the pantry staples made with tomatoes – tinned, paste, passata, sun-dried and more – each a variation on the bright-red theme. It’s that desire to capture summer in a jar, tin or tube that provides cooks with some of their snappiest tools for layering tomatoey flavours. Yes, there’s nothing quite as glorious as a perfectly ripe, raw tomato, but in cooking, adding all its derivatives into the mix opens up a world of creatively fine-tuning sweetness, acidity and freshness. This is made of three components – roasted aubergine, bulgur with tomato, and yoghurt sauce – all of which adorable on their own. Together, however, they make a truly memorable main. Heat the oven to 220C/425F/gas 7. Put the aubergine in a large bowl with four tablespoons of oil, half a teaspoon of salt and a good grind of pepper. Mix, then spread out on a large oven tray lined with greaseproof paper and roast for 30-35 minutes, stirring once halfway, until the aubergines are caramelised and soft. Take out of the oven and leave to cool. Meanwhile, put three tablespoons of oil in a large saute pan for which you have a lid and heat on a medium-high flame. Once hot, fry the onion for eight minutes, stirring a few times, until caramelised and soft. Add the garlic and allspice, fry for a minute, stirring continuously, until the garlic is aromatic and starting to brown, then add the cherry tomatoes, mashing them with a potato masher to break them up. Stir in the tomato paste, 400ml water and a teaspoon of salt, bring to a boil, turn down the heat to medium-low, cover and cook for 12 minutes. Add the bulgur, stirring it in so it’s completely coated, then turn off the heat and set aside for 20 minutes, so the bulgur can absorb all the liquid. In a medium bowl, mix the yoghurt with the preserved lemon, half the mint and an eighth of a teaspoon of salt. 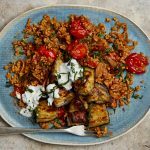 Divide the bulgur between four plates and serve with the yoghurt and aubergine alongside and a sprinkling of the remaining mint. Alas the only picture of this dish would be of two empty plates smeared with sauce and watched over by two burping, sated diners. It looks nice and it tastes great and if you want to see what it looks like then get off the computer and get into the kitchen. Now dammit! This needs to be baked in a lidded dish large enough to lay out the pasta at the bottom of the dish. Assume 6 pieces of pasta for each person and test the dish size by laying out the right amount of pasta straight from the packet. While the chickpea mix is cooling pour a generous splash of olive oil in the bottom of the baking dish. Put the oven on to warm. Chop the eggplant and zuchinni into large chunks. Chop the celery and the herbs, have a glass of wine, go feed a bird some seeds and whistle to them a bit. They’ll think you’re mad and pity you for not having wings but the gift of some seed to eat will see you good. Stuff the Lumaconi pasta with the chickpea mix and lay out the pasta at the bottom of the oiled baking dish. If there is any mix remaining just add to the dish. Bake covered in a prewarmed medium oven for about an hour. Check about the 40 minute mark to make sure it is not drying out. If so add more water/stock. A very hearty tomato stew, thickened by cashew cream. Is it Stroganoff? Strictly not of course, but then again sometimes a close brush with reality is all we need to anchor ourselves to the thin crust of sanity. The day this dish entered our damaged and seemingly deranged world the overnight air had frozen the heavy dew on the roof at Ridgesong and long, thin tongues of ice slid off the eves as the morning sun broke weakly threw the heavy mist. Brrr….. At that, my little lovely, is what a fire is for! Serve with Garlic Bread. Enough for two for a hearty stomach full. It’s not spaghetti tempehgnese. It’s not lasagne. It is pasta based though – and it cooks in the oven (mostly). Woo hoo…it’s Penne Pasta Bake. More garlic than is socially acceptable; roughly chopped. Cook the penne according to the manufacturer’s instructions but for half the time. Meanwhile, saute the onion and garlic over a low heat in an ocean of olive oil. At the last moment add the pepper then remove from heat. Throw the cooked mix into a deep, lidded oven-proof pot (take the lid off first or you’ll make an awful mess). Add the parsley and rosemary. Once the pasta is cooked, drain about a cup of the liquid back into the saucepan you cooked the onion etc in and reserve the rest of the liquid. Add the miso to the saucepan and dissolve in the cup of pasta water and the white wine. Layer in to the oven proof dish in the following order; the pasta, the fresh herbs, the aubergine, the chickpeas, the olives, artichokes and sundried tomatoes (and chopped capers if using) and the cauliflower. Pour the miso stock over and then drizzle very generously with olive oil. The level of the water should be a centimetre or two below the cauliflower i.e. the florets should be exposed. If you need more liquid to achieve this level use some of the reserved pasta water; discard what you don’t need. Bake, covered for 30-45 minutes. For the first 15 minutes after putting the meal in the oven crank the temperature up, I mean really crank it. This will get the party started (especially if you’ve had a few glasses of that white wine) and much reduce overall cooking time. After 15-20 minutes reduce the heat to 220c. A gentle word of advice from experience; much sadness results from forgetting to turn the over down from FURNACE and back to 220c. I found this recipe a while ago, and bookmarked it. I knew that one day soon I would think to myself, hmmm, I feel like cooking something different today. And today was the day. I am often happy to cook meals that I have cooked many times before, as they involve little thought, unlike Veghead, who much prefers something new and exciting to come from the kitchen. The original recipe I found on the blog of Carol J. Adams, who was given the recipe by Shirley Wilkes-Johnson, apparently a vegan who had been around for a very long time. I changed the recipe around a little bit, due to our preferences, and reduced the amounts significantly as there were only two of us eating it, not ten. here the recipe calls for 1 package ground beef style veggie meat (I have no idea how much that is as the recipe is American). I used chickpeas, 1 or 1 1/2 cups, which are yum, unlike the sound of that fake meat. Preheat oven to 204.4 repeater degrees celsius (this is the metric conversion of 400 fahrenheit). 205 degrees is probably OK. Place the eggplant and potato slices on well oiled baking trays and brush them with more oil. Bake for 20 to 25 minutes. While the eggplant and potatoes are roasting, sauté onions, capsicum and mushrooms in olive oil over medium high heat for about 5 minutes or so. Stir in tomatoes and passata until mixed. Add chickpeas and the herbs and spices. In an oiled baking dish, add a layer of eggplant slices, then a layer of potato slices. Add a layer of the chickpea mixture then cover with potato slices, then the rest of the eggplant slices. To make the Béchamel sauce, blend all the ingredients together and bring to a low boil, stirring constantly until the mixture thickens. Pour sauce over eggplant. Bake at 176.667 degrees celsius for about 30 to 35 minutes. Allow to stand for 10 minutes before serving. Leftovers are good the next day. This statement is actually written in the recipe but I think that is so obvious that it doesn’t need to be said at all. The VegHead exceeded government guidelines on the consumption of alcohol last night. Thursday was, therefore, a “slow” day. Earlier in the week, prior to this unfortunate slip in decorum, The VegHead and SheWhoMustBeFed had earmarked Thursday dinner as Beetroot and Aubergine Sri Lankan Curry night, on account of having a particularly nice looking aubergine (tight, dark flesh and firm to the touch) as well as two precooked (and un-vinegar-ed) beetroots in the fridge. However, come dinnertime both comfort food and ease of preparation was called for. Thus, I introduce to you “the lazy version” of the curry. Total cooking time is not much more than the time it takes for the aubergine to cook through. Hing is the Indian name for asofetida, which together with a big, fat, grated root of fresh turmeric is the spice that gives the most to the flavour of this chick pea curry. Many recipes have asofetida thrown in to the hot oil at the beginning of cooking, together with the other dried spices and chillies. However The VegHead finds that its flavour is overcome and lost if this is done, and prefers instead to sprinkle a little in once most of the cooking has been done. Friday’s are the principal shopping day for the VegHead larder, and so Thursday nights tend to be “whatever is left” night. A shiny black-skinned aubergine begged to be eaten, and a pile of orange sweet potatoes just cried out to be culled somewhat. These, together with the big jar of chick peas in the fridge formed the basis for dinner. if using fresh turmeric root, grate and add now (best to only grate fresh turmeric root just before using or it browns quickly through oxidisation). Also add the asofetida powder. Simmer for another few minutes. thicken the sauce. The easiest way to do this is to scoop out the vegetables into a bowl using a slotted spoon, leaving just the sauce in the pan (off the heat). Then spoon out a little of the sauce into a small bowl, add a little corn flour, and mix all the lumps out with a fork. Then add the corn flour mix back into the rest of the sauce in the pan, and mix through thoroughly over a low heat. Then add the vegetables back in. This might sound fussy but it ensures a lump-free thickening experience at the expense of two extra bowls and a slotted spoon in the washing up. Even if they’re not your scene. Can on the branch split in two. 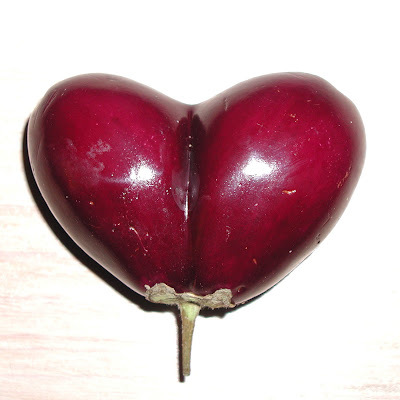 A passionate purple kitchen heart. Clearly nicer than eating meat. This recipe relies pretty heavily on you having some fresh Turmeric Root. 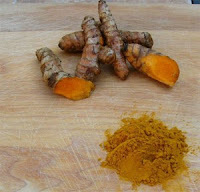 Though turmeric root is the source of the more common dried turmeric powder, it has a subtly different flavour. Turmeric root should is best grated on a ceramic ginger grater, just before you need to add it to the dish – it oxidises very quickly and then the bright orange turns a rusty brown. The act of grating turmeric root is also recommended for anyone who wishes to go to an X-Files themed fancy dress party as The Cancer Man. It is incredibly staining, and even if you immediately wash your hands your finger tips will be left with an orange tinge reminiscent of a 2 pack a day habit for a day or so. It is quite a cheerful colour actually and will serve as a happy remembrance of a lovely meal even as you sit the next day in yet another interminable business meeting getting a numb arse, and an earache from all the corporate nonspeak. 2 baby brinjal (aubergine), cut into thin wedges. It is best not to cut the brinjal until just before you need it, as the cut flesh quickly oxidises and turns brown. de-pod the cardamom seeds from the pods, and then dry roast together with all the other dried spice seeds for 5-10 minutes. Then grind to a course powder in a mortar and pestle. add the brinjal and the grated turmeric root continue to simmer for a minute or two. The brinjal should best be still a little crunchy. Simmer longer however if that is not to your taste. A VegHead reverse engineering of an oft ordered entree from our favourite local Moroccan restaurant (Al Fassia – in Windsor). Al Fassia serves this on a bed of finely chopped lettuce, the fresh green of which offsets the brilliant red of the dip in a dramatic manner. If you choose to do it that way, do not spoon the aubergine dip onto the lettuce until just before you serve, or the leaves will wilt and stain. Saute the aubergine, onion and garlic in olive oil. Do not allow to stick. add water until just below the level of the tagine base. Bake the covered tagine for 60 to 75 minutes or until the water is mostly boiled away.